The sun emits radiation that travels to the earth, this radiation we call solar energy. The solar energy is transmitted as electromagnetic radiation of various wavelengths. Before the solar energy reaches the earth it has to travel through the earth’s atmosphere. According to Paschal Phelan, Chairman of Solar Capital, during this time the energy transmitted is reduced by, for example, absorption, scattering and reflection mechanisms due to the content of the earth’s atmosphere, pollution, cloud cover, etc. Phelan explains that the term irradiance is the measurement of solar power; it is the rate at which solar energy connects with a surface e.g. the earth. The unit of power in which it is measured is a Watt (W). With solar irradiance the general measurement is as the power per unit area i.e. Watts per square meter. Irradiance is therefore recorded as W/m². It should be noted that the actual irradiance connecting with a surface constantly varies. Therefore irradiance is a measure of power – the rate at which energy falls – not the overall amount of energy. Phelan says that Direct Normal Irradiance (DNI) is defined as the amount of solar radiation which is received per unit area by a surface that is perpendicular to the sun’s current position in the sky. The amount of irradiance can be increased by keeping the surface perpendicular to the incoming radiation. DNI is important to concentrated solar thermal installations and other installations that follow the position of the sun. “Global Horizontal Irradiance (GHI) is the total amount of shortwave radiation received by a surface horizontal to the ground. This measurement is of particular interest to photovoltaic installations”, says Phelan. Phelan says that, as solar panels produce electricity through the reception of photons of sunlight, it makes sense that these panels be located in areas with the highest irradiation levels. “The amount of irradiation at any one point on the earth will depend on the latitude, the local climate and the season,” Phelan adds. According to the South African Department of Energy, the whole of Africa has sunshine all year round. “The annual 24-hour global solar radiation average is about 220 W/m² for South Africa, compared with about 150 W/m² for parts of the USA, and about 100 W/m² for Europe and the United Kingdom. This makes South Africa’s local resource one of the highest in the world,” says Phelan. 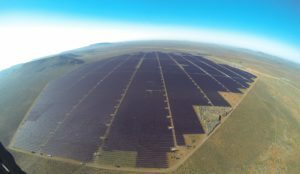 Stellenbosch University, in cooperation with GeoSUN Africa and GeoModel Solar, on 24 August 2016 released updated solar maps for South Africa (http://energy.org.za/news/158-new-solar-resource-maps-for-south-africa). Two maps were released showing the DNI and GHI which will be of significant interest to concentrating solar power (CSP) and concentrating photovoltaic (CPV) power facilities in establishing the best areas for implementing their facilities. According to Phelan, 3 200 kWh/m² per annum is the highest DNI predicted in the Northern Cape, this shows an increase of 10% in some areas compared with past released statistics. The latest GHI figures show an increase of about 3% per annum which means huge potential for photovoltaic (PV) power.